Why Choose a Staffing Company? We are going to approach this question from both angles. As an employer, why should you choose to have a staffing company help you recruit for your next open position for a leasing consultant, property manager, or maintenance personell? As well as why should you as a job seeker try choose to use a staffing company to find your next employer. Let us begin by taking a look at this from the employer side of things. In today’s economy, it’s great that you’re hiring. The apartment industry seems to be growing and with that growth comes the need for more employees. Whatever your reason for needing a new employee, finding them often takes a lot of effort and work on your part. You need someone to fill that void in your work place and someone who can ideal come in and stay for a while. That’s where a staffing company like Hire Priority comes in. The worst case scenario occurs when you make the decision to hire someone and then realize later that they were not a great fit for your company. You will have invested training, time, money, and hours getting this person into their new position before knowing you may have made the wrong choice. Much like shopping and trying on clothes, a staffing company gives you the opportunity to try on different employees before making the investment into hiring them full time. They handle the screening, the interview, and they often have people ready to jump right into the next position at your apartment community. As an employee, looking for a job is work itself. Often, out of desperation you may take the first position that is offered. Again, the above scenario may apply. What if that company culture does not suit your personality or your work style? Once you are finally hired, it is very difficult to quit and start the search over. If you choose to go through a staffing company, then you too have an opportunity to shop different companies and apartment communities to find the right fit for you. If you spend a few weeks in a position and find that it is not the perfect fit, you can contact your staffing company and have them help move you to another place. Keep in mind that you should look for a staffing company that specializes in your industry. It creates a match made in heaven, where employees who want to work in the apartment industry apply with staffing agencies that place employees with employers in the apartment industry. Everyone is specialized these days, and when you’re simply posting your open job positions out there, you may not be targeting people who already have a passion for your industry. 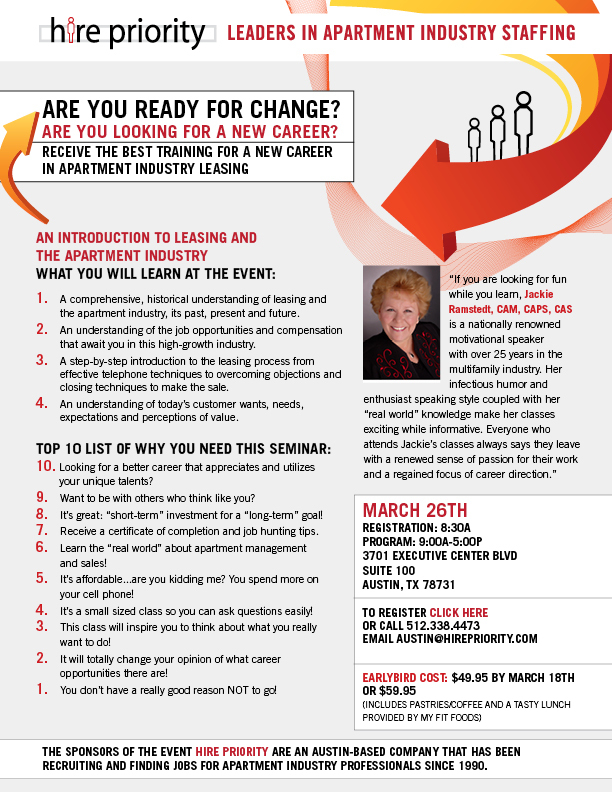 Intro To Leasing with Jackie Ramstedt! Introduction to Leasing with Jackie! Amber got her start in the apartment industry through a friend in San Antonio who needed the extra help. She started out as a leasing consultant in that apartment community but soon found herself without a property manager and hopes of being promoted into a higher position. Unfortunately, she wasn’t afforded the opportunity to advance and Amber felt it was time to move on. And move on is exactly what she did. Amber packed up and left San Antonio looking for a completely new adventure and a new start in Austin. She says she arrived in Austin on a Monday with hopes of beginning a new life with a new career. She heard about Hire Priority through a friend and came in on Wednesday and was immediately placed in a Leasing Consultant position. According to Amber, she arrived on Monday, not sure if she would be able to stay in Austin and not sure of what was next, but… thanks to Hire Priority, she was working by Wednesday! Amber worked as a temp at a few different communities and was offered a full time position at one of those communities. However, she just didn’t feel like that was the right community for her and turned down the offer while she continued to work through Hire Priority as a temp. Eventually Amber was placed into an administrative position at The Edge at Easton. Her property manager quickly saw Amber’s talents and potential. She was soon offered a full time position, not as a leasing consultant, but as an assistant manager. Amber says she absolutely LOVES her job! Her advice to anyone looking for a job is that if you want it bad enough and you work hard, you’ll get noticed and get placed into a position that may be even better than you originally imagined. Amber Gonzales now has twelve employees who work for her. She has a great mentor in her property manager and Amber says he has a great passion for the apartment community they manage. Amber loves her job because she is surrounded by an amazing team and a great support system. Her move to Austin has paid off and she is exactly where she wants to be doing something she loves. If your maintenance supervisor doesn’t seem as motivated as they used to be, then there may be several underlying factors that contribute to their lack of motivation. Understanding how to motivate your maintenance supervisor also requires that you understand why they may be demotivated. Sometimes the smallest things mean the most. When was the last time you stopped your Maintenance Supervisor to say “Thank you”? Do they know that you appreciate all that they do for you and your residents? Make sure you acknowledge their hard work. Your Maintenance supervisor and technicians are what keeps your apartment community running smoothly and what keeps your residents happy. Don’t forget to tell them how important they are and how much their work is valued. One of the most frustrating things in any job is to not have all of the necessary tools to complete the task. Imagine trying to keep up with emails from prospects, residents, and vendors without reliable internet service. That is how frustrating it can be for a maintenance professional who is tasked to do a job without the proper equipment. Talk to you maintenance supervisor about what tools, parts, and equipment they need to get the job done. Try to help make sure you have all of those things available and if they are not, then make sure to talk to your maintenance supervisor about when they will be available. Are you understaffed? Does your maintenance supervisor feel overwhelmed with requests and not enough staff to properly take care of customers? Make sure to keep communication open about labor needs. Sometimes, it will help re-motivate your maintenance supervisor if they know that you understand their frustrations and are working toward a solution together. Is there a work place issue that is bothering your maintenance supervisor? Talk to them to find out if there are safety concerns you need to address together and reassure them that they are an important part of your apartment community and you will address any safety concerns with them. Try to help reduce the stress associated with their position. Do they get bored taking care of the same types of maintenance requests just because that is what they specialize in? Allow some flexibility and new challenges for your maintenance supervisor so that they get to expand their knowledge and have some variety in their position. Most of these motivational factors can be helped with solid communication between the property manager and the maintenance supervisor. If it is simply not in the budget to fix the staffing or equipment problems, then make sure they know that you empathize and are not simply ignoring their needs. Bring in breakfast or lunch once in a while just to let them know you appreciate their work. And as always, keep the lines of communication open and professional.